The Japanese Maple Tree that is such a popular feature in many gardens, include both Acer palmatum and Acer japonicum species. It is the cultivars of former that the most sought after variety as a garden plant in Australia. The demand for Japanese Maples in Australia has steadily increased over recent years. Being available as dwarf grafted varieties as well as small trees, landscapers can find the right sized tree for most locations. Used widely in garden plantings for the autumn color as well as the graceful appearance. Young trees are available for sale by Mail Order, Retail and from Retail Nurseries. Smaller trees that are around 2 years old are available for as little as $25 each. These are the type that can be posted as bare root plants in winter. More advanced specimens can range up to $500 plus for a large established tree. Types include: Upright (Acer Palmatum), Dissected cut leaf types ( Acer palmatum dissectum), variegated types and many cultivars. What do the Japanese call Japanese Maples ? 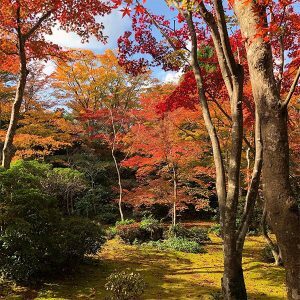 Momiji – This actually means the changing colour of the leaves or autumn leaves. However now is mostly used to refer to Maple Tree autumn foliage. Also means Baby’s hands which refers to the very young foliage. Kaede – Thought to be the original Japanese name for Japanese Maple trees. Also means frogs hands, again referring to the young foliage. Japanese maples are happy in sun or shade but prefer some protection from the hot afternoon sun and drying winds. They grow best in a well drained humus rich soil. Trees should be staked and watered well until established especially during dry periods. After two – three years most varieties can withstand dry periods and could be regarded are drought tolerant. We suggest digging some well rotted compost and cow manure into the area where you intend to plant the tree 3- 4 weeks before planting. Stake and water in well with a liquid seaweed fertilizer as this encourages root growth. The best planting time is in early autumn when the soil is still warm and some root growth can be encouraged before winter. Some varieties are more tolerant of sun than others, those that fall into this category do not suffer leaf burn on hot days. Fertiliser for Japanese Maple trees will depend on your soil, in general a slow release all purpose fertiliser applied in spring is a good solution. In good soil they actually require very little extra fertiliser once established. Although it does differ depending on your climate and the variety, the best place to plant most Japanese Maple trees is in afternoon shade. This will give you better foliage colour as it will prevent leaf burn. In cooler climates they will take more sun. Acer palmatum Inaba Shidare is regarded as one of the best for full sun. In general Japanese maple trees are not fast growers, although some are faster than others. For example Acer palmatum Emerald Lace is regarded as fast. Acer palmatuum Mikawa Yatsabusa is regarded as very slow, however, very beautiful. Soil for Japanese Maples should be humus rich, moist and well drained, a typical description would be a sandy loam. In terms of ph, ideally it should be only slightly acidic, generally around 5.6 – 6.5. So in very acidic soils, you may need to add some lime, if the soil is overly alkaline, then adding organic matter can help, although very alkaline soils can be difficult to modify. These are a tree that requires little pruning however they may be pruned to shape if required and dead, damaged or diseased wood should be pruned. Our favorite cultivar is Acer Palmatum dissectum seiryu the only upright Dissectum (cutleaf) variety. Hardy, vigorous and dainty light green foliage turning brilliant Autumn tones of red and orange. The upright species and cultivars have a classic ‘vase like’ shape, broadening out to a wide crown. The main attraction is the foliage, which is either green, red or gold in new growth and turning a range of shades from gold to blazing reds in autumn. Once established these plants are hardy and require little maintenance. They make excellent small shade trees and are a great ornamental feature in the garden. Suppliers of hardy, bare root trees, from June to late September.We service VIC, NSW, QLD, & SA. Nationwide Trees supplies a broad range of deciduous tree seedlings, rootstocks and some conifers. Semi Advanced trees. Wholesale direct. Contract growing. Plane, Birch, Nyssa, Magnolia, Cypress, Linden.